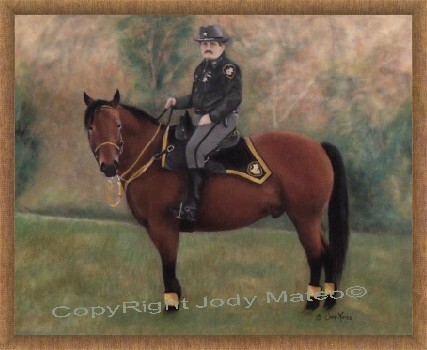 Florida - What greater way to honor a police horse or mounted police officer can there be then custom pastel art work by artist Jody Mateo of Florida. Wether it's an honored police horse who's been given a retirement from active duty or a mounted patrol officer deserving special recognition, artist Jody Mateo can capture that image. The recent commission of Police horse "Gus" shows off her ability to depict a police horse. Those who have seen the artwork immediately comment "That's gus!". Gus was a great subject since he is known too many area children from his visits to local elementary schools. Jody's artwork first gained attention as an artist of pet portraits. It was her husbands work as a deputy sheriff that got her a few commissions to do police K9 dogs. That beginning of doing service animals has naturally led to work of police horses. Jody's artwork is done with pastel paints on acid free suede mat boards. The pastel gives the artwork a soft lifelike look to the artwork. Her artistic talent helps capture the unique facial characteristics of the animal which makes them who they are. Comments on her work have included, "You can almost see the horses personality in the painting", and "That painting portrays the horse better then any photograph can". Jody is a custom artist based in Florida. Our motto: "Don't Horse around with Drugs"